I have been using these headphones for sometime now and they sound really good. I am a music enthusiast and I like checking out speakers, amps, etc when I visit any elctronics store. Therefore, I can chategorize good sound. About these headphones I can just say they provide refined bass, good mids and highs. Vocals sound really good. quite comfortable and light. They can provide deep sound when needed and give really good acoustic sounds (viz. piano, acoustic guitar.....). They sound crisp and clear. The sound has a sence of openness. Its like when you put them on you feel blocked (block 65% of outside noise) but when you start playing them, they sound really open. Previously I've been using a Beyerdynamic DT 131. They are also great. They only reason I bought HD 448 was it has got just the right amount of bass which makes music sound warm. 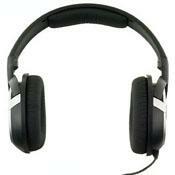 And DT 131 is not an over the ear headphone whereas, HD 448 are. The HD 448 can provide really good articulation at all levels (Lows, mids and highs). They are little costly and I didn't like the build quality that much. Value wise I give them 3.5/5 and overall I give these headphones 4/5.